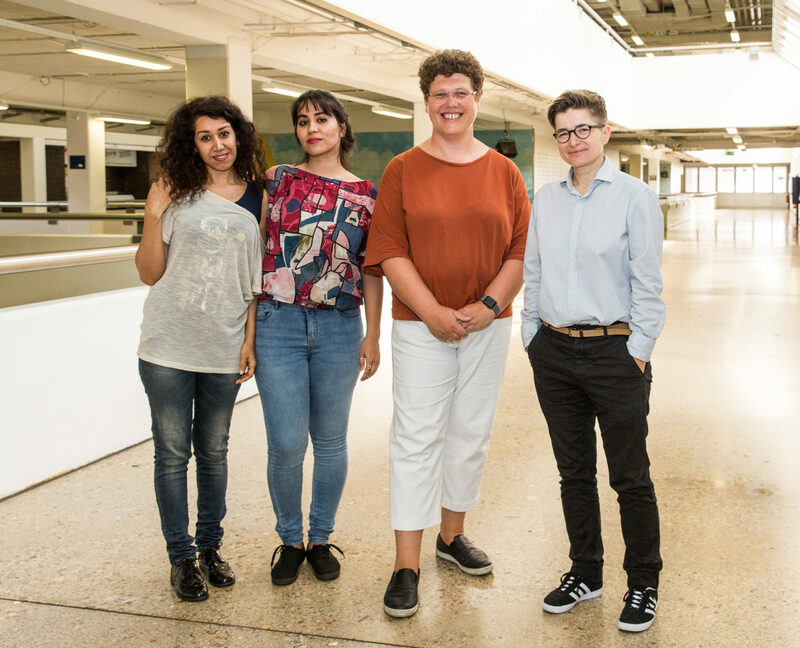 Talking about Queer Base, making clear the urgency in terms of human rights of the association’s work, means first of all describing the alarming human-rights situation of people who are fleeing and who identify as queer. Imagine, you have to flee because the possibility of being disclosed as a man in women’s clothing is a death sentence. You are forced to repress your identity until the point where you are no longer even sure who you actually are. You have no idea what it is like to live your everyday life untroubled, with confidence. When fleeing, you are surrounded by people who might share the same national fate as you but nonetheless entirely reject your queer identity and possibly want to kill you. Then you arrive at supposed safety in Austria and in order to meet the requirements of applying for asylum as a “member of a social group” you have to tell a total stranger that you are not sure who you are and that because of this, have run for your life. Being in danger, no longer being safe, is the main reason that people throughout the world take on the multiple risks of flight. For people who identify as queer, it is about every facet, about every nuance of security that is grasped under this term. The (rain)bow stretches from the safety of being alive and remaining alive to the safety of being able to live out the identity that you have and choose, unrestricted and without danger. Being sure of oneself, feeling safe in one’s skin and in one’s surroundings: people with queer identities are persecuted in many countries in the world, their human right to life is permanently questioned. Most of them are forced to disguise their identities, to hide their true selves. The constant fear of being discovered, the permanent life necessity of disguising oneself, leave behind deep scars. In this situation of incessant pressure, some are able to escape, which bears enough risks, per se. For people who identify as queer, added to those risks is that they might be exposed and revealed, discriminated, bullied, and injured by others who are fleeing, who perhaps also want to kill them. Isolation and elevation of the chance of violence in remote accommodations Confrontation with the superficiality of queer awareness in Austria and the widespread pathologizing of queer identities in the medical field as well as elsewhere. As one of the clients said at a Festwochen event in the Turquoise Rosa Lila Villa on June 4, 2017, “Queer Base helps us with everything.” Especially with the start in a “good and safe life.” Safety in this context means also pointing out at the Festwochen event that photos should be taken and distributed with caution. Not so much because of the copyright issue, but because of the reaction of those who consider queer identities a personal affront, which they react to with various forms of violence. A life affirming photo of a festival event as potential trigger for, at best, a verbal injury, but more often so, an injury to one’s physical integrity. 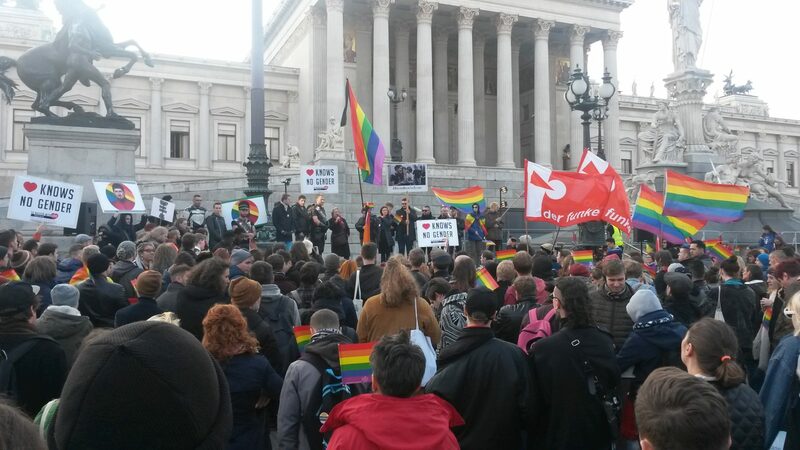 There have already been murders of people who have fled and sought asylum in Austria because of their queer identity. People who are supported by Queer Base, make obvious that security is mainly a question of survival. The discourse about security, that is already obscenely militant, which has had utterly obscure and dubious effects in terms of human rights, blurs our view of protection from violence, of the intense necessity of preventing violence in the most common everyday contexts. Queer Base focuses on these—vested—aspects of security and concentrates on the securing of a safe space—a safe environment for people who are lacking it in many ways. For people who have fled due to their queer identities, a Safe Space means mainly also emotional security: to be able to move and be in a group without having to control oneself, entirely freely, uncensored, just as one is. Being oneself, being sure of oneself: finding one’s identity after years of denial and the internalization of stigma, finding a space of calm. A brave and also difficult step, in every regard. Accompanying peers, people with similar views and related life experiences, which Queer Base makes possible, is therefore an invaluable support. The depiction in the media of people who are escaping is—to be polite—mixed.1 At times it is as though people are denied their humanity, that they are revoked the right to be a subject, and therewith the bearer of human rights. Turning people into objects has manifold consequences, which along with the gradual loss of rights also means a great deal of violence. The tendency for violence against people who are “different” is increasing, the experiences of violence of people who are fleeing increases greatly.2 People who identify as queer are caught in several spirals of violence. One spiral that should be emphasized to illustrate the work of Queer Base, is in dealing with trauma. Trauma can be what triggers people to flee. The experiences while fleeing can be traumatizing. The experiences at the border, the first contact with official representatives can have traumatic effects. In some ways it makes sense to house refugees together according to their nationality; for people who identify as queer, it is simply dangerous. To be surrounded by those people from whom one has fled, means being baited, discriminated, and most likely attacked. Logically conceived measures for preventing violence5 mean, in this case, a human-rights-based asylum process, and in any case, immediately contacting facilities such as Queer Base. A request that the most recent proposals in the area of asylum—key word: structure of accomodations6—fully oppose and which make the work of Queer Base in this area, entirely impossible. Finally, a few words about Queer Base as a private organization facilitating the implementation of human rights. In Austria, civil society is a term that truly depends on one’s perspective. Grass roots organizations that become active are not necessarily the first ones that come to mind when the administration talks about “civil society” (social partnership organizations are often more obvious). Also, voluntary involvement is strangely often viewed as a separate theme and the links to the realization of human-rights responsibilities (civil servants as main support for emergency services) are not directly seen. With all confidence, it is possible to identify the financial support of civic involvement, in the broadest sense—also with reference to human-rights, to the non-profit-status in foundation law—as capable of expansion. 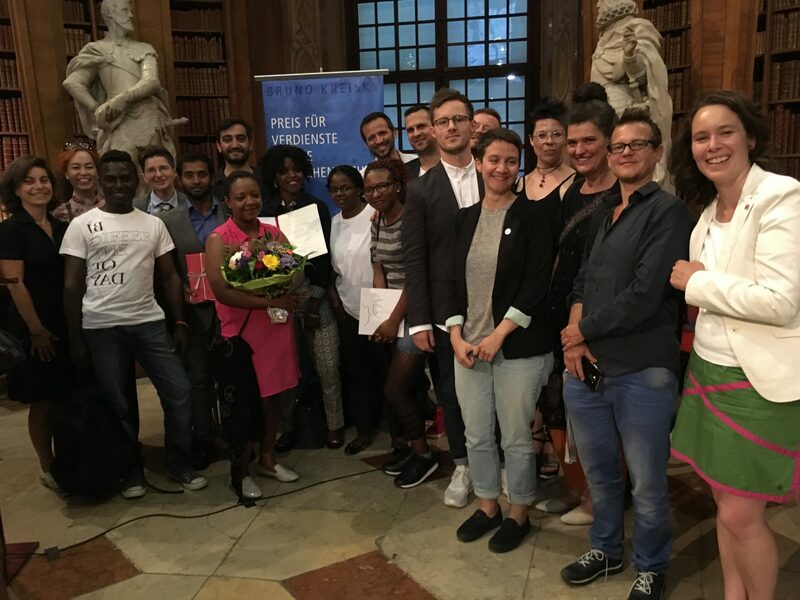 From this angle, the commitment of the founding members of Queer Base is to be praised on several levels: here, a small civic initiative jumped in, at great risk, to cover diverse state responsibilities—first, asylum as a human right and second, the responsibility of non-discrimination11. “The urgency of now” has taken on a very dramatic meaning in light of the persecution and threat faced by people who identify as queer; the members of Queer Base can rightly call themselves life savers. Nevertheless, this liability falls on the Republic of Austria to protect and guarantee the human right to life. I congratulate Queer Base on this well-deserved distinction with the Bruno Kreisky Prize for Human Rights. 2 Fundamental Rights Agency, Current migration situation in the EU: Torture, trauma and its possible impact on drug use, February 2017. 3 See, most recently, quite urgently: CESCR Committee, General Comment No. 22 Sexual and Reproductive Health, E/C.12/GC/22, Para. 23. 5 See Istanbul convention; as well as GREVIO shadow report: https://www.interventionsstelle-wien.at/umsetzung-der-istanbul-konvention-in-oesterreich-beurteilung-durch-ngos page 36; see in general: Purth “Gewaltschutz für alle Frauen – juridikum” / Standard http://derstandard.at/2000041399764/Gewaltschutz-fuer-alle-Frauen. 6 See position taken by Amnesty on the draft of the Austrian law for changing alien rights laws 2017 part II – FrÄG 2017 from May 18, 2017. 7 Vienna Declaration and Program of Action, A/RES/48/121, Para. 5. 8 See most recently CESCR Committee, Concluding Observations, E/C.12/AUT/CO/4; see also the report of the special ambassador for cultural rights, Austria, A/HRC/20/26. 9 Fundamental Rights Agency, “Professionally speaking: challenges to achieving equality for LGBT people,” March 2016. 10 Article 14 Universal Declaration on Human Rights & Article 18 Charter on Fundamental Rights of the European Union. 11 See, among others, Istanbul Convention. 12 Contribution of the Parliament March 2017. We thank Marianne Schulze for her support!